The NX series is designed for speed. It’s our fastest, most powerful laser ever—delivering the highest cutting power per watt. When combined with our patented Cross-Flow Resonator, the result is unmatched precision and efficiency. This high performance series is available in 4000W and 6000W resonators. Every critical component of the NX is manufactured by Mitsubishi and designed specifically for the machine. 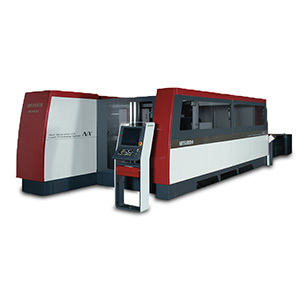 This allows us to achieve unparalleled stability and reliability in our machine tool. The NX features the newest M700 series control from Mitsubishi—for the ultimate user experience.